← Think about Monarch Butterflies when you watch the Super Bowl this weekend. I am trying to get a project started which would manage existing storm water detention basins as butterfly habitat. It is still in the planning stages–I don’t have an organization yet, but here is how I think it would work. The area to be managed would be identified and evaluated. A management plan would be written and signed off by the owners or managers of the area. Changes would be made as appropriate, and there would be surveys for butterflies conducted on a periodic basis throughout the butterfly season. At the end of the year there would be another evaluation and the plan would be updated. I have some storm water detention basins in mind and would like to use them for a pilot project. So how do you build the system? I’m not sure I know. But I am working on it and floating the idea past people who may be able to help. Maybe something will shake out from this. 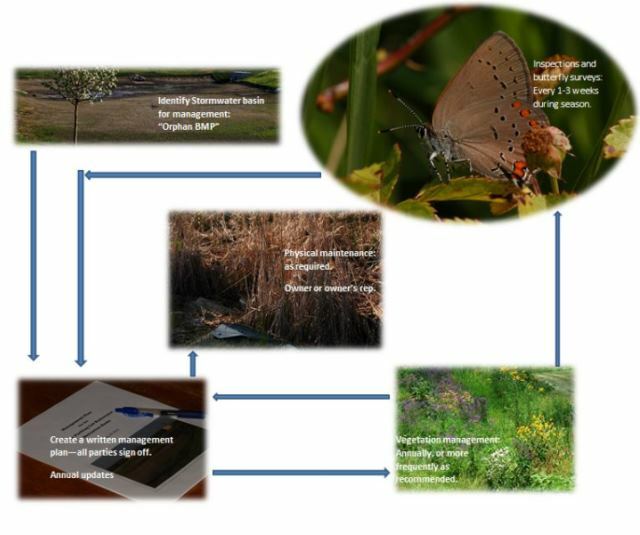 This entry was posted in butterflies and tagged affecting change, butterfly conservation, storm water detention, storm water structures. Bookmark the permalink. love the idea. let me know if i can support you in some way. Harlan, I’d commend to your attention the detention basin/prairie wetland project being developed jointly by UNI and the city of Cedar Falls. Dr Kathy Scholl of UNI’s dept of HPELS is a good person to contact. It covers a good-sized piece of ground, featuring ponds, marshes, small stream flowages, and riparian woodlands. Last year it was just about the only site where I could find butterflies regularly–18 species that I could identify and/or photograph–albeit in low numbers. Thanks, Bill. I will contact her.